Pre-Full Time Travels | Follow the Tumble Lees! We’ve seen really cool travel maps from other’s blog sites (here’s my favorite one from a couple we are following) but when we tried to make ours, it looked confusing. It’s at the bottom of this page, so we’re going to break our trips down with a summary of our time spent on each road trip up until we became full timers. We haven’t been able to blog about each location as initially hoped. 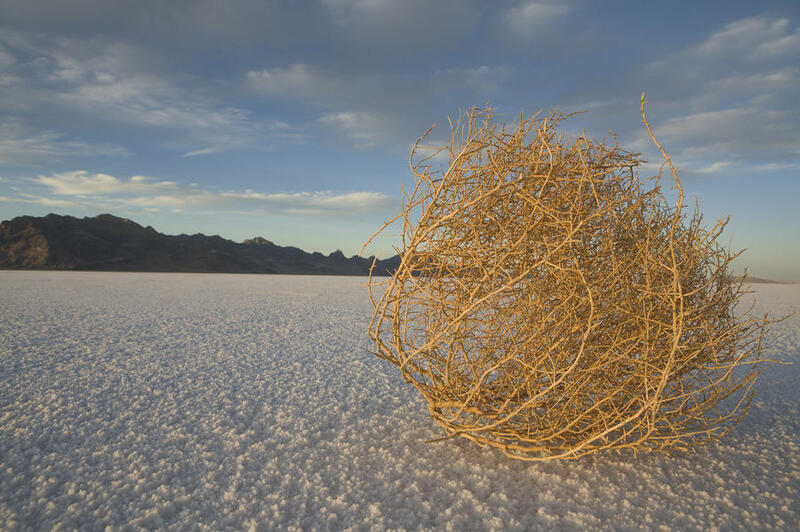 We can blame it on poor internet connectivity and poor time management – having too much fun to find time to blog – but then we need the blog to help us remember what we’ve done! So we went home and began to plan our “maiden voyage” to Port St. Lucie RV Resort. We lived about smack dab in the middle of these two resorts, so around a two hour drive to our home. Again, we were so comfortable, we couldn’t wait to make our first trip up to Fredericksburg, Virginia to spend a month with our first grandson. Our daughter had to return to work when her baby was 2 months old. So we suggested coming up for a month to watch him so he wouldn’t start day care until he was 3 months old. What a blessing that was! We were excited to get there, but to also begin some fun adventures in our new RV. So we stopped at Jekyll Island, South Carolina (#2 on map) for our first stop on the way up the coast. There was great history (we did a self guided walking tour as well as the tram tour) and fabulous beaches. A very serene island! We enjoyed church at the friendly and historic Baptist Church. What a great time and we vowed we would return one day! But so far, we haven’t….By the way, we love the beach, which was one thing we had in common when we first met! 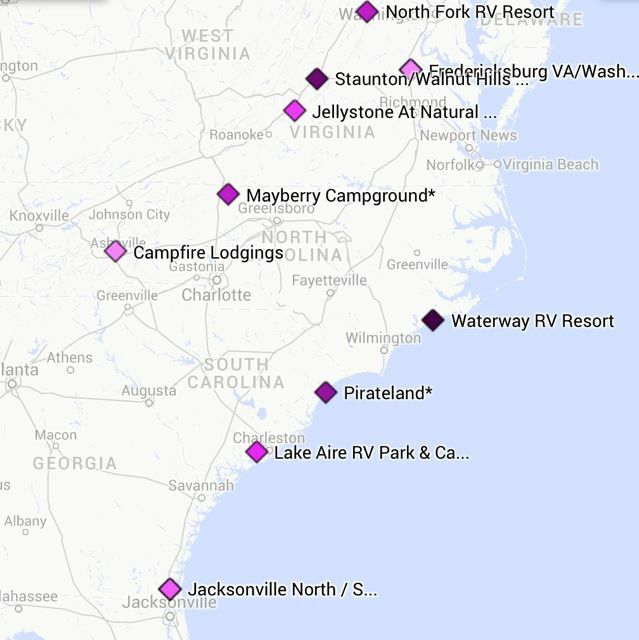 Bill researched and discovered the closest RV parks that were right on the beach were in Myrtle Beach. While it sounded good, I (Debbie) was a bit concerned about all the sand getting into our moving parts, our slides! But my fears were alleviated when I saw we were actually on the other side of dunes and on a concrete slab. So we stayed in Ocean Lakes Campground (#3 on map) and discovered Myrtle Beach is the best beach for a long walk! We vowed we would return and we have! After staying on the beach, it was time to go learn how to be grand parents. So off we were to the Fredericksburg/Washington DC KOA Campground (#4 on map), just a few miles from our daughter’s home. This resort is very nice, but I don’t know how bigger RV’s make it down the narrow and winding road. It is very convenient from I-95 but far enough away that you don’t hear the road noise. We stayed here for 40 nights and loved every second we had with our precious grand baby. If not for the fun so far in our RV, I may have put my foot down and said we need to move back to Fredericksburg….but that would have not gone over very well with Bill since he vowed he would never move back there due to the traffic! But I digress. Bill has a knack for finding interesting places to visit. So after some research, he selected Forest Lake RV (#5 on map), Advance, North Carolina. We didn’t blog about this stay, but we had a blast. However, this campground was a bit lacking in ambience, but it had all the amenities we needed (full hook ups). And the bonus was that since I post on Facebook where we are, we were able to meet up with a long lost cousin and had a great time touring the Billy Graham Library and Museum with them. We also had some great hiking (Boone’s Cave, Lexington, NC) as we discovered in 2003 how much we love to hike in the mountains. We both love history, so finding interesting places to visit, coupled with either mountains or beaches makes for a lot of fun and adventure for us. Speaking of history, our next stop was in Milledgeville, Georgia, the first state capital of Georgia. The campground name was very deceiving but the history we stumbled on made up for the basic campground, Scenic Mountain RV Resort (#6 on map). Good parts about the “resort” (a term that doesn’t really do it justice) was that it was conveniently located to the wonderful history, the price was excellent (Passport America), laundry room was nice, and the NEW staff was super friendly and helpful. The downside was that most of people in the resort were full time residents. That tends to change the “ambiance” of a park. What we loved about Milledgeville was that it is a small college town and the historic area has been fabulously preserved. We visited several mansions, but our favorite was the Old Capital Museum. The Docent or tour guide was a college student studying history. What a bonus and it was our favorite historical tour to date. We enjoyed church at Covenant Presbyterian Church – same name as our church in Sebring. As for hiking, we couldn’t find that scenic mountain! 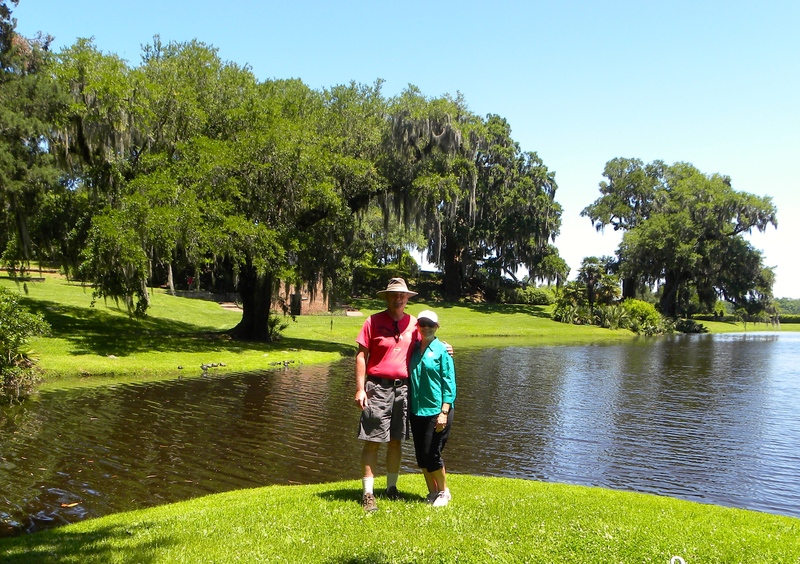 But one mansion we toured had a great self-guided walking tour of the grounds, a good one mile walk. 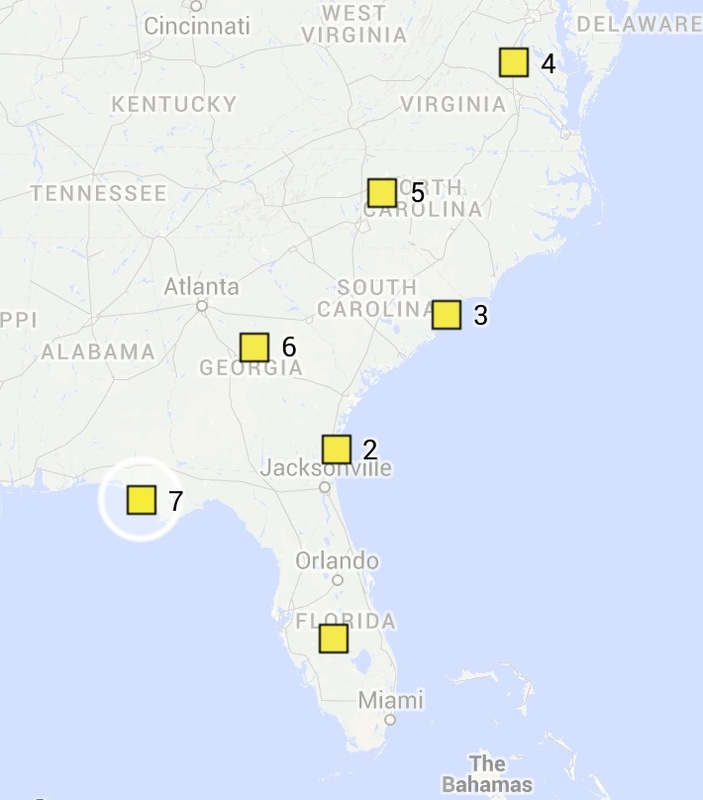 And the final location, Panama City Beach RV Resort (#7 on map). You get what you pay for! This was our most expensive resort to date, but it was absolutely fabulous! I’m not good at keeping track of how much we spend, but it was around $45 and they did give Good Sam Club discount. We actually met friends here (they camped in a pop-up tent in the Saint Andrews State Park, within walking distance) there for the Thanksgiving Holiday. The bad news was that it was the coldest week ever! The water was turned off one night due to the freezing temperatures. But hanging out with friends made it OK. We enjoyed an evening at their campsite with a campfire cooked dinner (yummy!) and they came to our camper for a warm Thanksgiving dinner inside (it was so cold outside). We each prepared part of the meal so it was no burden for anyone. We had planned to cook a turkey in our new stove…what a shock when we finally looked inside it. You can only cook a pan of brownies in it! So we did cheat and let Publix cook the turkey for us. Now the best lesson we learned here was when to travel. The absolutely worst day to try and drive, especially when it was a normally 7 hour trip, is the Sunday after a holiday. It took us 11 hours to get home. NOT FUN towing a 5th wheel. What is so sad is that since we are retired, there was no rush to get home and we wished we had stayed another day or found a place to stop about 1/2 home. So we vowed we will limit our travel days and actually learned the best days to travel are Tuesdays and Thursdays for some reason. And we absolutely loved the long journey and the 56 nights! We learned how to be flexible this time out. 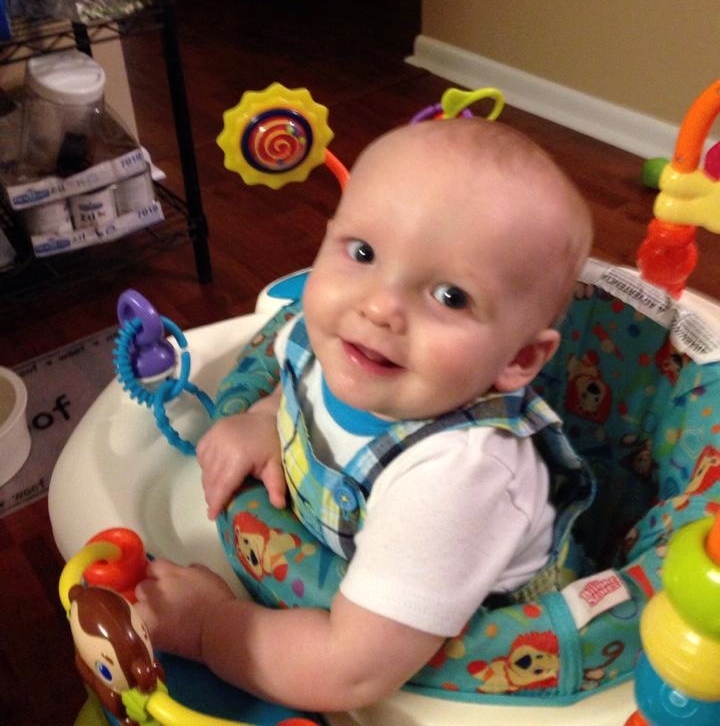 Our grandson became ill and couldn’t be in day care. I can pack a suitcase in about 30 minutes, so I flew up as fast as I could get to the airport. We had planned to return for Christmas, but not sure if the weather would allow it. We had two weeks to decide. Bill joined me about two weeks later, towing the RV! So he made his first trip by himself, traveling to Jolly Time Acres, St. George, SC. It was a Passport America campground, basic, but the friendly staff made it pleasant. Bill learned he can hook up and unhook the 5th wheel by himself as well as do all the setting up. 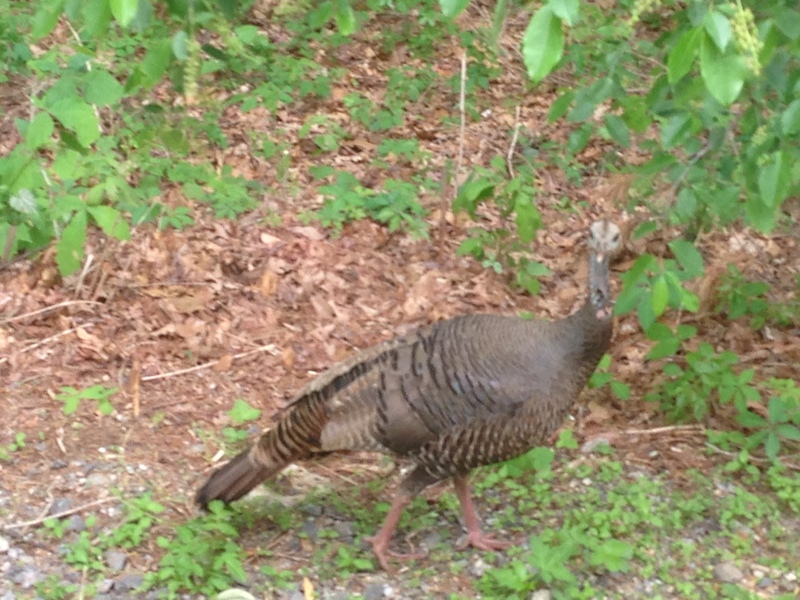 Then he headed back to the Fredericksburg/Washington DC KOA campground again, for our second stay. That was over 800 miles in two days! But since he traveled mid-week, traffic wasn’t bad. We had a fantastic Christmas, having a grandbaby made it so special. My sister and her husband live about 2 hours away from our daughter, so it was great that they came up for the day and we meet again a few days later. 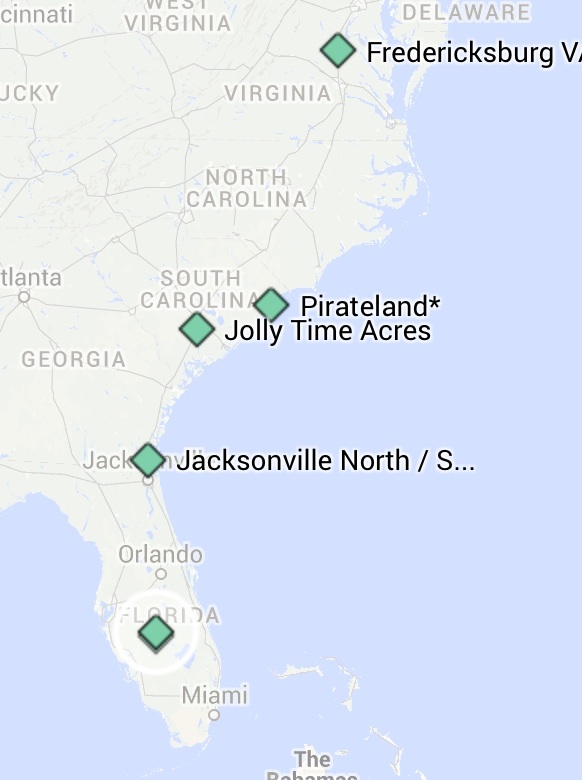 Our trip home was back to the beach, Myrtle Beach, but this time, PirateLand. It was next door virtually to Ocean Lakes. We ended up preferring PirateLand because they give the Good Sam Club discount. Both are equally good, although Ocean Lakes may have a bit more ambiance! This winter was unusual, so we were told, so it was a bit cold. In fact, the day we left it was 19 degrees! As Bill unhooked the water, some dripped as usual, but it froze the minute it hit the concrete pad! Thanks again to FaceBook, we got up with an old prayer partner from our first church in New Jersey. So we hung out with him some, had dinner together, visited his home and learned more about the area. Our final leg of the trip home was to stay in the Jacksonville North/St. Mary’s KOA. We joined KOA so earned enough points for a free night! This KOA is very convenient to I-95. The staff is outstanding and of course, there are all the normal amenities. Plus it has a nice layout that we could get in a two mile walk at night. By now, we have spend a total of 87 nights in our RV and towed it 4,627 miles. We are beginning to dream about going full-time! FIFTH ROAD TRIP and last before we become full-timers! Time for our spring visit to our daughter to celebrate her birthday and our anniversary (in the same month, so we make a big deal for both every year). Might as well see as much as possible as we have the luxury of time for this road trip. We stayed at 9 resorts and this time decided to add the mountains to our return trip. But was you may begin to notice, we are returning to some of our favorite places, if nothing else, they are convenient for our trek between Florida and Virginia. First stop is back to the Jacksonville North/St. Mary’s KOA. It had been about 10 weeks since we were out in the RV. It was in the shop nearly the whole time getting a bunch of warranty repairs taken care of. We also began to sell off our rental properties as we now have the vision to go full time. So Bill had to do a lot of labor (worked 7 days a week for three weeks – but took time off for Church) as he prepared some of the houses for sale. We are learning as we age, we need to take our time doing things (like packing) so we had a great list of everything we knew we needed as we planned for nearly two months on the road. But of course, we forgot the wonderful lunch we had packed for our arrival to the KOA (it’s only about 4 hours from home), rain gear, shower soap, and dish soap. Thank goodness for Walmart for the little things, but guess we’ll get wet if it rains (main thing is to use while Bill may empty our tanks in the rain). We initially planned to go to Cedar Creek, NC from here, but when we woke up, we heard Myrtle Beach calling us! What a draw it has on us. We stayed back in PirateLand. This time we toured historic Georgetown. We arrived in summer clothes, but quickly had to bundle up! We loved the history of the rice plantations. We didn’t know that this area was the rice capital of the US until after the Civil War. We only stayed here 3 days as we needed to get to our daughter’s to help them get their townhome ready to sell. Who would have known we’d be trying to sell our homes at the same time as our daughter. But it helped that Bill is a good painter and really can do about any work needed around a house. So that was how he kept himself occupied while I took care of our grandson, who had a cold. Then Bill got sick as a dog with the flu! He was down and out for about 5 days. I ended up with strep throat, but caught it right away so I only missed one day. So without going into great detail, we needed a week off, so we headed down to Cedar Point, NC for 4 days. We had a great time, discovered Emerald Isle; met up with our family’s Marine who gave us a tour of Camp LaJune and had dinner with his family (he and his wife have a son and twin girls); toured Fort Macon and learned more civil war history, and found a few places for some good walks. It was a really full four days! Then back to Fredericksburg to work and find time to celebrate our anniversary and our daughter’s birthday. Sadly, it was time to leave our grandson. We never knew a baby boy could change our lives like he did! But then, there was another Baby Boy who changed the world! We are looking forward to celebrating His Birthday this CHRISTmas! So off we were to return to Florida via the mountains, after all, it was now spring time. We decided we wanted to travel on the Skyline Drive and Blue Ridge Parkway. We did make the entire Skyline Drive and it was pleasant enough, just a bit too slow since we were meeting friends. So much to see and so little time! We actually thought about returning and possibly boon docking on the parkway, but decided we’re addicted to the luxury of full hook ups! We stayed at the entrance of the Skyline Drive to get us oriented (and pay $10 for a week of on and off the parkway). I blogged about our stay at North Fork Resort in Front Royal, Virginia. Let’s just say we loved the mountains but we probably won’t return to this particular resort! It was definitely the worst one so far (and as I write this after 39 stays, it is still the worst one). Why? The way they treated us! It had the basics we needed, full hook up, but the initial phone call for the reservation should have been a clue they don’t like “strangers.” And it went downhill from there…. Our next stop at the Staunton/Walnut Hills KOA had to be better and it was like night and day! WOW, they made us feel so welcome and couldn’t do enough to make sure our stay was the best. And this one ranks up there as one of the best! We were asked if we’d like to back up to the lake for one thing. Awesome! The “neighbors” who watched were a hoot and very friendly! We loved this place alone and will return one day! Sadly, we haven’t had time to blog about it, but I’m inserting a photo gallery to capture the essence! No blog for the next two stops, either. Next, was a short drive so we stopped over night and had a full day to see the sights. We stayed at Yogi Bear’s Jelly Stone Camp Resort at Natural Bridge, Virginia. What a nice campground and beautiful sight this was. We didn’t stay longer because we had a deadline to meet up with our friends. We want to return and spend more time here and especially see the night time Natural Bridge Light show, which tells the story of creation. Our next stop was Mount Airy where we stayed at the Mayberry Campground. This was a love at first sight experience! From the initial greeting at the office, to the site, the sights around town and the hiking, we vowed to return and we have! We stayed three days and they were three of the most relaxing days of all! No wonder Andy Griffith was such a charming and sweet man! This town raises them that way! Our next stop was our driving force to get us finally to Ashland, NC. We had wanted to visit here for the 10 years we lived in Fredericksburg but just never made the time. This is one of our best experiences, really enjoyed the church we found, had great hiking and camping with friends – the same friends we spent Thanksgiving with at Panama City Beach. Thankfully, I managed to find time to blog about this GREAT time with our dear friends! Not sure if I ever mentioned, they were the ones who encouraged us to try the mountains for a vacation. It was now time to get back along the coast, to I-95 to bee-line our way home to Sebring. But first, we spend a fabulous 6 days in Charleston, NC. I was able to blog about this great historical city. The campground was very basic, full hooks ups and a decent enough laundry room. The location was good as we drove both south and north to see all the sights. We tried to see everything so we wouldn’t have to return. We think we succeeded this time. I guess I didn’t mention that part of the reason we are in North Carolina so much is to see if there is a location we would eventually want to settle down in – since Bill doesn’t want to live in Fredericksburg again. I’m OK with that, but my only request is that we live only about 5 hours from our grandson. So far, nothing has really hit us. But Myrtle Beach is the biggest draw, but we don’t think we could live in a resort town again. We lived in Virginia Beach for 7 years. It is also beyond my mandatory 5 hour drive! LOL! Our journey is about to come to an end on May 20, 2014, with another overnight stay at the Jacksonville/St. Mary KOA. We’re so glad these excursions ended on such a positive note. We’re now ready to make the plunge. Miraculously, all of our rental homes sold in the depressed market and didn’t kill us too badly (we had a lot of solid equity). So now for the last one to sell – our own home, as well as Bill’s motorcycle (sold the day we “listed it” to someone who had expressed an interest). And to get rid of everything! So in the midst of all this, our daughter’s home sold and they bought a much larger home. So praise God, we’ll gave her a lot of our furniture! We love how things just manage to work out. But we had no idea how busy our June was about to become because we also have a date to travel to Illinois to spend 10 days with Bill’s mom (June 26-July 8, 2014). 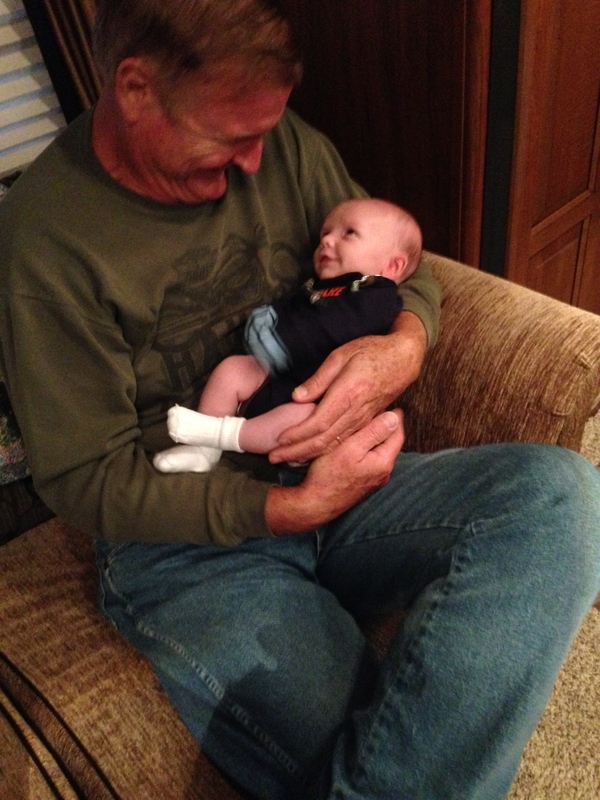 We were approaching six weeks of not seeing our grandson – and it’s my birthday and Father’s Day mid-June. So we decided to just drive our car up and stay in a hotel for a “quick trip” from June 12-June 21. We could help our daughter move out of her house along with the celebrations. And wouldn’t you know it, we listed our house right before we left and it sold on June 15 with a closing date of July 15! Talk about adventures! What a whirlwind June and July became! 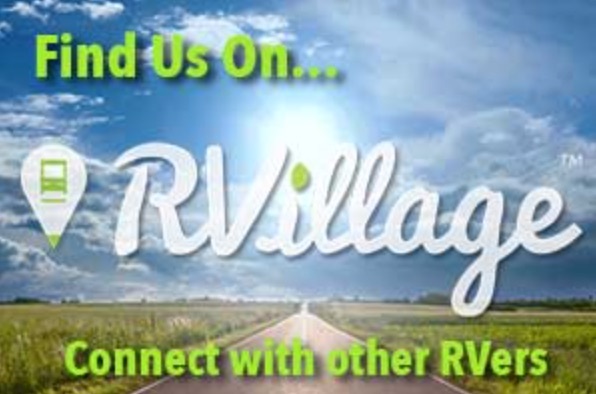 We blogged about it here, where we ended up becoming Full Time RVers – on July 15, 2014! We’ll let the pictures speak for themselves! What do you like about being full timers? It is a simple, minimalistic lifestyle – which we love! In fact, we feel like we are the 20 year olds that met 40 years ago and got married without a dime to our names, and in fact, I brought some debt along (college and a car). Thankfully, we are debt free and we now have more than a few dimes to rub together. Not just anyone can do this, though. We discovered yesterday, a travel day and a “real world” day that you have to be flexible and be able to go with the flow! So to do this, you have to be very FLEXIBLE! 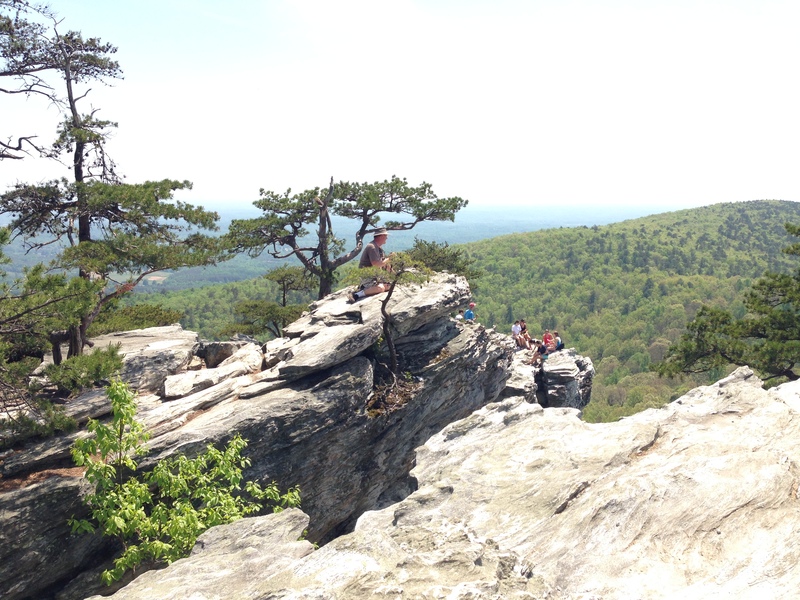 Bill on top of a peak on Hanging Rock in Stokes County, NC. This is significant because he is terrified of heights! HOW OUR RV TRAVEL ADVENTURE STARTED: In August 2013, we turned a new chapter in our lives as we both began to turn 60 (Bill first). Two things happened: Our first grandchild was born, and, we came out from under “work” obligations (we owned rental properties but Bill officially stopped working in the “real” world in Nov. 2004 when I was transferred to Miami and I retired in February 2006. And then I worked part time for our local sheriff and school board for five years). We are so blessed that these two things happened at the same time and in fact, have to give Glory to God as it all was really a miracle! So we now had a dilemma, our grand baby boy is over 800 miles from our home. Bill is now ready to enjoy the retirement we planned for many years ago and be able to enjoy our grand baby. AND we want to travel. So we bought a 5th Wheel and now take our home with us wherever we go, which includes frequent visits with him! We are now both in our sixties (just barely) and we see a need for Adventure Travel columns or blogs to help us along. We actually subscribe to a few and decided we would add our own flavor. Maybe we can inspire someone else. We welcome comments, questions and individual contact. This is our 5th campground since we bought our RV on September 4, 2013. At the conclusion, we decided these were the best 40 days of our life! We arrived a few days before Jessica went back to work after maternity leave and before Colin’s 3rd month of life. We were only six miles from them, so it was convenient. We got a 30 day discounted price, but we ended up staying a bit longer as well. We decided it was worth the extra price as t his is a very nice campground. We could walk about two miles every night, if we didn’t mind a circle or two! Here is a picture of Jessica walking with her dad and pushing Colin when we first arrived! I like to end with a spiritual note of some sort. So as we think about 40 days (or nights) I think of the spiritual significance of this number in the Bible! We know Jesus was tempted in the desert for the same length of time! I’m sure during that time, it felt like forever – but then the Lord knows what forever is, so it was maybe like seconds for him! For us, this time also flew by but at the same time, we savored every minute! Part of our Adventure Travels is to learn as much history as we can in the place where the history was made. And Charleston, SC is one fabulous city (and surrounding areas) to learn and see as much history in it’s original locations. We actually stayed at Lake Aire RV Park and Campground, Hollywood, SC, about 15 miles from downtown Charleston. This was a nice campground for the price! It was actually a great location for two days of our sightseeing days. Our first day, I discovered I had lost my ear buds to my iPhone, so that was a priority to replace. I did a quick search and discovered there was an Apple Store in Charleston, so off we went once set up to buy a replacement set. While we were out, we saw a sign to Folly Beach. Good friends had just told us to be sure and visit it, so we also took a drive to check it out! There was some road construction and we discovered our big truck doesn’t maneuver very well in tight places, like the streets of Folly Beach! But we were glad we saw it! It was 90 degrees when we arrived, so it was great to be on a beach! Day 3 was a rainy day. We had lots of little things to do around the RV and we needed to research how we were going to sightsee! Bill made a big pot of homemade beef vegetable soup (we don’t talk about this much, but we prefer to cook and eat at “home!”). We wanted to see some plantations, the museum and historical houses. Individually, it would be expensive, but we were able to buy a Heritage Passport, a ticket to see nine “must-see” historic sites at a 40% savings! Perfect! So we ran downtown and bought the pass to be ready to start our next day. “First settled in the late 17th century with its main family residence constructed in 1705, Middleton Place was acquired through marriage by Henry Middleton in 1741 and for a century and a quarter was the family seat of four generations of Middletons who played important roles in American history. Today a National Historic Landmark, it has miraculously remained under the same family stewardship for some 320 years. Henry Middleton was the second president of the First Continental Congress and his son Arthur, a passionate revolutionary, was a signer of the Declaration of Independence. “Drayton Hall is different. It’s the real thing, and we are bound by our mission to preserve the property—that is, to keep it in near-original condition just as the National Trust received it from the Drayton family in 1974. “Instead of being restored to the vision of those who lived centuries after it was built, Drayton Hall is an artifact that has survived the American Revolution, the Civil War, the earthquake of 1886, hurricanes like Hugo, and maybe most surprisingly today, urban sprawl. We didn’t take pictures of the “river walk” we took after a wonderful tour inside by a great tour guide. We really enjoyed both of these plantations! They offered a great contrast in the way history is “preserved” so to speak! “The house was built in the late Federal style by Scottish shipping merchant Charles Edmondston at the height of his commercial success. In 1825, it was one of the first substantial houses to be built along the city’s sea wall away from the noisy wharves and warehouses further up the Peninsula. But a decade later, economic reversals during the Panic of 1837 forced Edmondston to sell his house. It was purchased by Charles Alston, a member of a well-established Low Country rice-planting dynasty who quickly set about updating the architecture of his house in the Greek Revival style. Among the features Alston added were the third story piazza with Corinthian columns, a cast-iron balcony across the front, and a rooftop railing bearing the Alston coat of arms. “In the 1840s and 1850s, business visitors were received on the first floor while the family’s intellectual and social diversions took place in the drawing rooms on the floor above. “The house has remained in the Alston family since 1838. Many pieces of the family’s 19th century furniture, books, and other personal belongings remain in the house – much as they have since the Alstons witnessed the dramatic events of the Civil War. “Nathaniel Russell was born in Bristol, Rhode Island. He settled in Charleston at the age of 27 in 1765, when Charleston was a bustling seaport. By 1774, Charleston boasted a per capita of wealth nearly four times that of all the American colonies. Russell’s career as a merchant involved the shipment of cargoes to and from New England, the West Indies, South America, Virginia, Great Britain, continental Europe, West Africa and Asia. “While most of his profits came from the exportation of staples, such as Carolina Gold rice, indigo, tobacco and cotton, Russell handled a broad range of imported goods. He also participated in the African slave trade both before and after the American Revolution. We didn’t take pictures, but I was able to get these off literature. This staircase was breathtaking! You have to see it in person. The public can no longer walk up the stairs to further preserve them. All I thought about was how much our daughter would have loved this staircase! “The Aiken-Rhett House Museum, 48 Elizabeth Street, is unique in many ways. For example, it remained in the hands of family descendents for 142 years until it was sold to The Charleston Museum and opened as a museum house in 1975. Historic Charleston Foundation purchased the house in 1995 and adopted a conservation approach to the interpretation of this important house and its outbuildings. “Located on the corner of Judith and Elizabeth streets, Charleston merchant John Robinson built the house in 1820 as a typical Charleston double house with a central hallway and two rooms on either side. The original front entrance was located on Judith Street, where the piazza, a Charleston term for a double side porch, is now located. When Robinson lost five ships at sea in 1825, he was forced to sell the house to meet his financial obligations. Subsequently, it became the property of William Aiken Sr. in 1827. “Aiken, an Irish immigrant who had accumulated a large fortune as one of the city’s leading merchants, used the house as a rental property. When he died suddenly in a carriage accident, his vast holdings were divided between his wife, Henrietta Wyatt Aiken, and his only son, William Aiken Jr.
“In 1833, the young William Aiken and his new bride, Harriet Lowndes, decided to make the house their primary residence. They began an extensive renovation of the property. Three main changes took place: the front entrance was moved, the first floor was reconfigured, and a large addition was built onto the house. By all accounts, they created one of the most impressive residences in Charleston. “A successful businessman, rice planter, distinguished politician and governor of South Carolina, William Aiken Jr. was one of the state’s wealthiest citizens. Following a well-established tradition among Charleston’s elite, Governor Aiken and his wife traveled in Europe and returned with magnificent fine art and furnishings. In 1858, while abroad, Governor Aiken commissioned his cousin, Joseph Daniel Aiken, to design and oversee the construction of an art gallery, the only one of its kind in the city. Today, many of the objects acquired by the Aikens on their travels remain in the rooms for which they were purchased. “The Aiken family library, containing more than 2000 volumes mostly published in the 1800s, has recently been transferred to the Charleston Library Society archives and placed on long-term loan. Many of the books are signed by family members and were purchased on their travels through Europe. “Prior to the Civil War, the Aiken-Rhett House was maintained by a population of highly skilled enslaved African Americans who worked to sustain the Aikens’ high standards for elegant living and entertaining. Occupations within the household included carriage drivers, cooks, footmen, gardeners, laundresses, nursemaids, and seamstresses. A post Civil War document reveals the names of 14 slaves that lived at the Aiken-Rhett House and attended the family: Tom and Ann Greggs, and their son, Henry; Dorcas and Sambo Richardson and their children, Charles, Rachel, Victoria, Elizabeth, and Julia; Charles Jackson, Anthony Barnwell, and two carpenters, Will and Jacob. Many of these individuals remained in Charleston following Emancipation, and Jacob Gaillard and Henry Greggs lived and worked at the Aiken-Rhett House until their deaths in 1896 and 1908. “The back lot of the Aiken-Rhett House is where the slaves worked and lived, and they probably took their meals communally in the kitchen. A unique site, the Aiken-Rhett House retains both original outbuildings. One is the kitchen and laundry and the other a carriage and stable house, above which are found sleeping quarters. Many of the rooms had fireplaces, and paint evidence suggests these rooms were painted vibrant colors. “One of Charleston’s most exquisite antebellum structures, the Joseph Manigault House, built in 1803, reflects the urban lifestyle of a wealthy, rice-planting family and the enslaved African Americans who lived there. 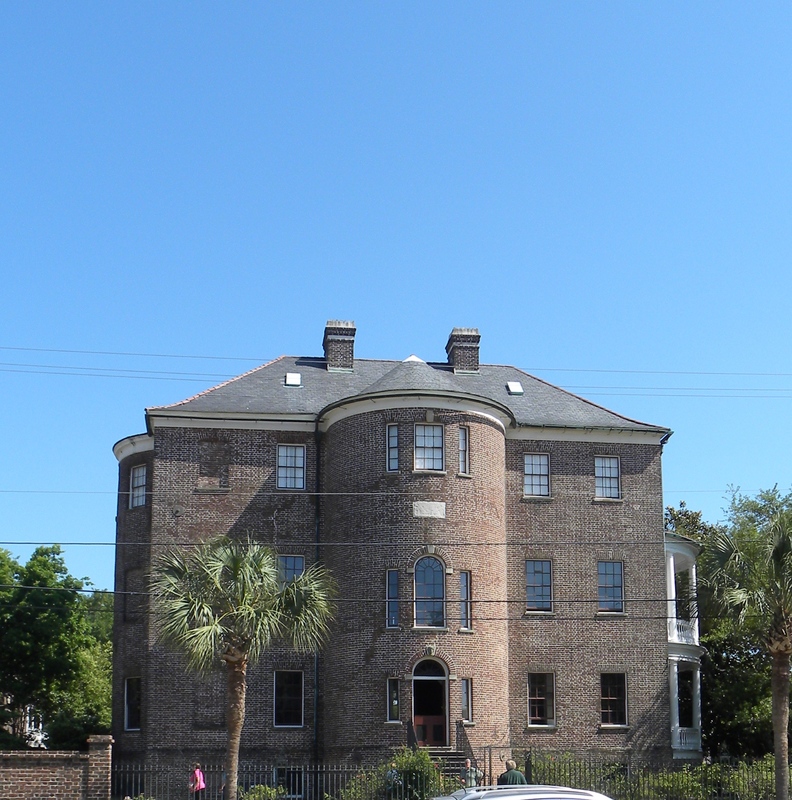 An exceptional example of Federal period architecture, this elegant townhouse, a National Historic Landmark, was designed for Joseph Manigault by his brother Gabriel, who is also credited with designing Charleston’s current City Hall. “A striking spiral staircase accents the impressive central hall, and many of the rooms are restored to their original color schemes. All feature historic pieces from the Museum’s collections including a selection of American, English and French furniture dating to the early 19th century. Outside, a classical Gate Temple overlooks a period garden, and the locations of adjacent historical outbuildings (e.g., kitchen and slave quarters, stable, and privy) are marked with interpretive signs. 5) Last but not least, we visited The Charleston Museum. We could have spent most of the day just in the museum. We were about saturated with history, so we ended up only staying about an hour. It was one of the best we’ve seen and perhaps we will return one day and just enjoy it! I did find something cute to buy Colin! Speaking of Colin, he is 9 months old today! No official picture of him from today, but here is an adorable one of him a few days ago! He is ever on my mind! Our last day in Charleston was Sunday, so we attended Palmetto Community Church, not far from the campground. It was unique (although it was my style-contemporary, but Bill prefers traditional). We always pray our worship will be pleasing to God and that He will have a special message for us. And He did! The catch phrase was about checking our attitude to see our altitude (and focus of our hearts). Pilots look on the horizon to see their altitude: then to look up to go higher – and that was the message. He gave great scriptures and I think to just read them as one long thought, you can get the powerful sermon! Proverbs 4:23; Romans 12:2; Colossians 3:2; 1 John 4:4; Galatians 6:9. Above all else, guard your heart….Do not conform to the pattern of this world, but be transformed by the renewing of your mind. Then you will be able to test and approve what God’s will is—his good, pleasing and perfect will. Set your minds on things above, not on earthly things. You, dear children, are from God and have overcome them, because the one who is in you is greater than the one who is in the world. Let us not become weary in doing good, for at the proper time we will reap a harvest if we do not give up. We went home for lunch and then had to decide where our next stop was as well as figure out how to make the most of our last day in Charleston. I thought Bill had decided St. Augustine would work best. We had tried a few places the night before, but couldn’t get them to work. So I tried a place and actually made us a reservation. When Bill gave it more thought, he decided against it. Seeing how I have a bad rash, perhaps from poison ivy (or a reaction to a series of bug bites) but it was a bit contentious for us! We finally settled on just driving about 3 hours Monday and 4 hours on Tuesday. We decided we would go take a boat trip over to Fort Sumter. On the way there, I read very negative reviews on Trip Advisor. We decided to not go, but to look for a park to go take a good walk. There appeared to be so many places, it should have been easy to find a place. Well, a bit more contentious as we did something we said we should never do – drive without knowing where we are going. Our truck is very comfortable, but it doesn’t like to make quick u-turns or go down narrow streets. So long story short, we cancelled that out and went to get gas. 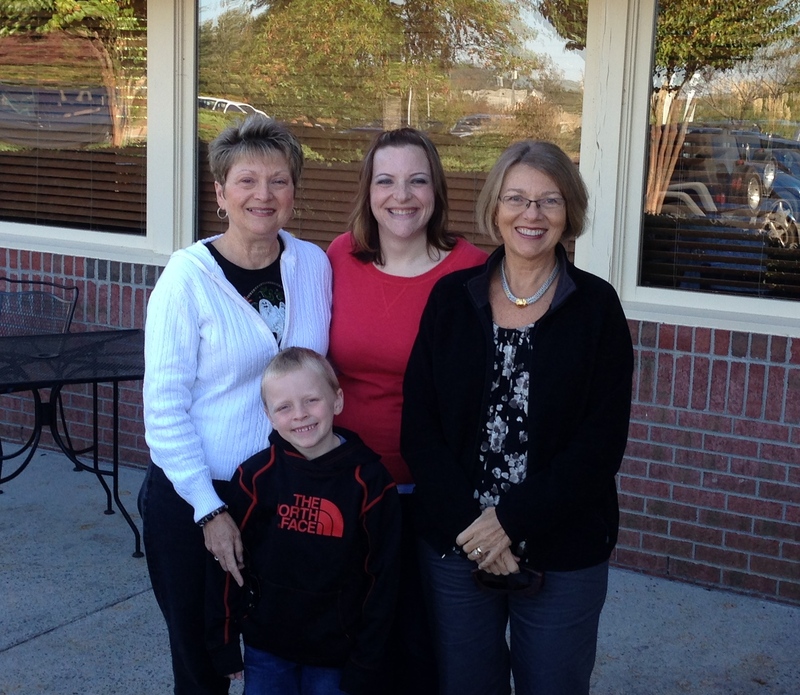 Um, about the sermon and our attitudes…we were being put to the test! As Bill was gassing up, he saw a big screw in the sidewall of one tire. How does one handle that? Well, seeing how we were right be a Walmart with an auto and tire center, we began to praise God – that we found it today and not when we were driving down the highway pulling our rig! We felt so blessed but yet we had some contention after a GREAT sermon! Ha, isn’t that just like the Lord to test you? Or were we testing HIM??? Well, we had a great nights sleep and took our time heading south the next morning! This is our last exciting place for a while….so stay tuned while we figure out what is next! Our friend enjoying the view! We have stayed in some very nice “resort” campgrounds. But we’ve noticed, we don’t spend any time there! We take off for the day, to sightsee or be with our grandson. So finally, we spent most of our time in Asheville – at the campground! We did pay more for this one, as with some of the other private resort campgrounds, and finally felt we got our monies worth. We do attribute this to the fact we met friends there and they know how to camp! This was our second time to camp with them and it made it really special. For one, they love making a campfire, so we really enjoyed it, especially the food cooked on it. While our particular sites didn’t have the view (covered by trees) we did take time and sat and enjoyed the view from this common area, where my friend is fully enjoying the beautiful view! We all sat here for a few hours, soaking it up! The ride up the mountain to the top to the campground was a bit challenging. All we could think about was what if a Class A motor home was coming down the hill towards us! There was only room for one vehicle! But they said they have never had a problem as everyone comes and goes during the proper check in and check out times. Well, everyone except us! We arrived early. Oh well, no one was coming down late. The manager said that if someone is coming in extra early, they will block the road so only one vehicle is on it. We talked to several owners of bigger RVs and no one seemed bothered by the drive up. I guess that means we are still rookies. Our second day there, Saturday, we went downtown Asheville to shop at Mast General Store. Bill and I needed new hiking boots and I needed a new pair of hiking pants. They gave us GREAT service! We were amazed at how vibrant the downtown was. Busy busy busy! Bill had to search for a place to park. Our truck doesn’t like old downtowns where the parking places a small. Since we’re not shoppers, so we were happy just going to the one store. Our friends visited a few other stores while we took our time getting fitted. We were all hungry for dinner, fresh mountain air, so we hurried home to start the grill and campfire. We had a wonderful dinner enjoying the outdoors. Sunday, we went to church, which was also Mother’s Day. We found Walnut Hills Baptist Church to attend. It was so vibrant and alive with young people and families! It was very encouraging! The sermon was one of those we will remember for a long time! The pastor used a snickers bar and a diet coke to illustrate his point. Ask us sometime about it! The rest of the day was pure relaxation – until time to cook an early dinner on the grill and campfire! We all pitched in, so that helped and was fun. We did spend a lot of time in the community park for the great views. One of the main things we wanted to see in Asheville was The Biltmore. Our friends had seen it many times before – and when it was cheaper – so we went after they left Monday (the husband still works). We didn’t know what to expect, except that it was a place to see. I was hoping it would be worth the money as it is a bit pricy…but we decided in the end, it was well worth it! We wanted to take full advantage of all it had to offer, so we were prepared to do some hiking and brought our lunch and lots of water. The hiking was really more around the grounds but in between the gardens. I saw one other “hiker” in hiking garb – we looked out of place! Most people seemed there for a little stroll where as we were dressed for hiking! It turned out to be just over 3 miles if you take all the side trails and walked all the gardens. While that was good, we were over dressed in our hiking clothes, but it was a good way to break in our new shoes we bought Saturday. We needed all the water I managed to carry as it was hot and sunny! Our time in North Carolina came to an end and we headed south on Tuesday. We wanted to see so much more, including Maggie Valley. A dear friend was going to stay in her family’s cottage nearby for a month. We had hoped to meet up with her, but missed her by 4 days. So much to see and do and so little time! 8Let me hear in the morning of your steadfast love, for in you I trust. Make me know the way I should go, for to you I lift up my soul. We have turned a new chapter in our lives. Two things happened this past August, 2013. Our first grandchild was born and we came out from under “work” obligations (we owned rental properties). We are so blessed that these two things happened at the same time and in fact, have to give Glory to God as it all was really a miracle! So we now had a dilemma, our grand baby boy is over 800 miles from our home. Bill is now ready to enjoy the retirement we planned for many years ago and enjoy our grand baby. We want to travel. So we have bought a 5th Wheel and now take our home with us wherever we go, which includes frequent visits with him! To start this, I decided to go ahead and make this as a “home page” and then link all our travels in separate pages so you can see where we’ve been and what we find fascinating to do in each town or community we visit. We will intersperse this with pictures and info on the growth of our grand baby as long as his parents allow us! Here is our travel list itinerary to date. And as I complete the pages to accompany each one, I will link it to a new page with the new locations. See # 1, #2, #3, #4, #5, #16, #18, #22 and # 23 for current links. But first, click here for a post about us going full time, which was official on July 15, 2014. 8). Panama City Beach RV Resort, 4702 Thomas Dr., Panama City Beach, FL 32408, Phone: 850-249-7352; 11/26-12/1 (5 nights) With friends. 15). KOA Fredericksburg, 3/26-4/13/14 (13 nights) Took Colin to Doc for 7 mo check up. Transition to Full time RVers! 27) Four Oaks RV Resort, 4596 U.S. Hwy 301 South, Four Oaks NC 27524. 7/17-18/2014. Please go to this post for our full itinerary.